​"A must-read, if ever there was one!" Olga is a true warrior—a peaceful one. This book boldly, and rightly, situates EMFs in the context of consciousness and spirituality. Of all the books I’ve read on EMFs, this one’s my favorite. 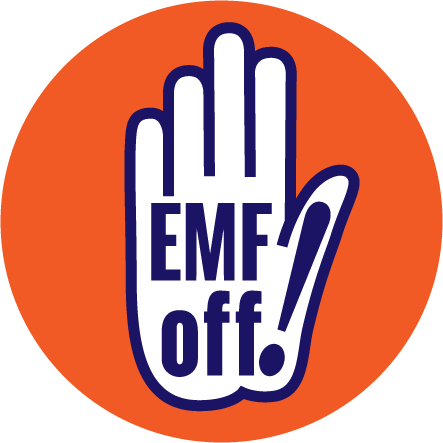 I have just finished reading your book EMF Off, which I found informative, educational, enlightening and filled with an immense amount of valuable information. Your writing is magnificent, your humor is so lovely—on one page, I was laughing out loud so hard. Current research is revealing that, within just five generations of low-level microwave irradiation, exposed species—from soil microorganisms to mammalian vertebrates and all plant life in between— could become extinct. Confronting what is arguably the most powerful opposing force on this planet, this book serves as an inspiration for those who wish to leave our world fit for all forms of life. On her odyssey back to health, Olga Sheean treads the little known but increasingly common pathway of illnesses caused by chemical and electrical sensitivity. Her story is one that everyone needs to hear as these devastating illnesses pervade our increasingly contaminated world. [...] We should all use this information as a preventative tool for our own long-term well-being. Olga sets the stage and gives hope to others suffering from chronic illnesses caused by a world where money and power trump life and well-being. This book helps everyone learn how to cope with the callousness of our society. This is an important book from someone with wide experience and a unique background. Olga shares her deep insights into both the personal devastation caused by man-made EMF energy and the vested interests that have hindered public health action to prevent such harm. Her analysis of the wireless dangers that society faces is balanced by empowering solutions made possible by scientific advances. I encourage all to read, learn, and join us in activism. As the fourth Industrial Revolution inexorably overwhelms the environment, one fears that matters will get worse before they get better, with the domestication of radiation through the Internet of Things. As a disability activist, I realize that sensitivity to electromagnetic radiation has yet to be recognized as the disabling condition that it is. Rare is the storyteller who weaves a tapestry of truth, science, environmental alerts, quantum physics and spirituality, laced with sheer determination and humor. Sheean pulls no punches in outlining the health impacts to humans, animals and planet from electromagnetic fields, along with solutions for dealing with this invisible force while protecting ourselves and our loved ones. Armed with knowledge, an irrepressible spirit and an irreverent sense of humour, Olga travels a journey of self-discovery and empowerment, revealing many of the ingredients essential to our well-being and the survival of our planet. Highly recommended to anyone seeking betterment, this book will find a home in your heart. A call to consciousness on many levels, EMF off! is informative, smart, sad and funny all at once. The touching afterword, written by Olga’s husband Lewis, will be helpful to other couples facing similar challenges. A must-read for a holistic view of the global effects of EMF in this technological age. I’m so thankful for this book. This is THE book that needed to exist, and I am grateful to Olga for writing it. She effortlessly interweaves her riveting personal journey within a higher call-to-awareness for EMF safety. It takes a brave, intelligent and enlightened author to write such a book. This book really conveys the message of how serious the consequences of our wireless technology abuse are. Olga tells us about her personal experiences and inner feelings in a very powerful way. As an EHS person myself, I can so relate to what she describes in many passages, and I can only be grateful to her for writing this piece of work. Sheean’s words help to water the over-digitised desert—both inner and outer—into which humanity, steeped in wireless-product marketing, is perceptibly heading with gathering speed. Whatever your current understanding of this field, I encourage you to read this book with an open mind and, through it, recover that pearl-beyond-price, the Precautionary Principle, and the inner strength to serve it. Olga Sheean’s book is a wake-up call for us all. Beautifully written, it describes her own severe health effects from EMFs, as well as the science on electromagnetic radiation, while providing hope and inspiration for creating a better world. May everyone who cares about health, the environment and our common future on this planet read this book and become part of the growing web of consciousness. ​To read full testimonials ​or to leave your own, click here. ​Contact us if you would like to be an affiliate for EMF off! e-book sales. ​Read sample chapters in different languages here. ​This book is the perfect way ​to find out about Olga's journey, what's happening in the world of EMFs and how you can protect and heal yourself. ​Olga ​regularly brings out new material. ​Sign up here ​to keep up to date with developments. ​Nah, just send me to Amazon right now! Sign up here to follow the story beyond the book! ​I agree to receive occasional emails concerning EMFs. Yes, I want to stay up to date with the continuing story. ​Then you'll go straight to Amazon. ENJOY! ​Keep up to date with news, developments, resources and more.